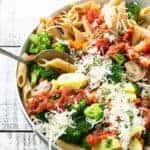 Whole wheat pasta with tomato sauce, parmesan cheese and plenty of fresh vegetables. Optional: 2 tablespoons chopped parsley. Cook the pasta in salted water according to package instructions. While the pasta is cooking, heat the olive oil in a large pan over medium-high heat. Add the onions to the pan and cook for 3-4 minutes, or until they've started to soften. Add the broccoli, carrots, squash, and mushrooms to the pan. Season the vegetables with salt and pepper to taste. Add 2 tablespoons of water to the pan. Cook for 5-7 minutes or until vegetables are tender and starting to brown. Stir in the garlic and cook for 30 seconds more. Add the cooked pasta and marinara sauce in the pan; toss to coat. Sprinkle with parmesan cheese and serve. Top with chopped parsley if desired.